Watch as Davison’s Better Way to Invent turns Christine’s Brownie Bowl idea into a store-ready reality! With the help of Davison’s creative team, Christine created the Brownie Bowl, which is designed to bake any type of dessert into a bowl that will hold all sorts of tantalizing toppings. Users can bake cookies, cakes, breads, brownies, cereal treats, or muffins, and they bake evenly every time. 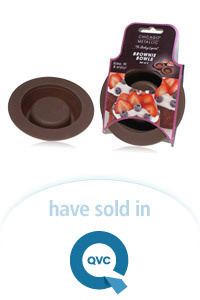 Thanks to its sleek, silicone design, the Brownie Bowl can cook at pretty much any temperature, with any recipe! The Brownie Bowl is even dishwasher safe for a very easy clean up! Reading, Pa., native Christine Walker watched (in horror) her high school boyfriend and his teammates make absolute messes out of their cafeteria trays with gigantic cookies soaked in milk. Christine knew there had to be a better way! So she came up with the Brownie Bowl, which is now licensed by Xtraordinary Home Products (under their Chicago Metallic brand) and is now selling as the Brownie Bowl on QVC – on TV and online!